Ami Bera, NRI doctor, is a U.S. Representative for California's 7th congressional district since 2013. 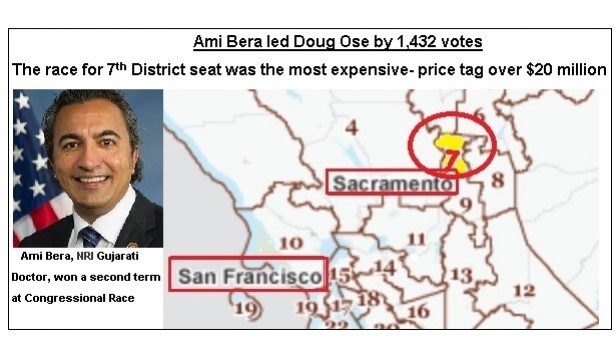 Bera, Democratic re-elected in 2014 despite a very competitive race. April 15,2019: NRI Ami Bera has offered to help the residents of California : NRI Congressman Ami Bera has offered to help the residents of California's Sacramento County who might be having issues with filing of taxes. Bera, the US Representative for California's 7th Congressional District, has been representing the Sacramento County since 2013. He announced on his Twitter handle that his office was eager to help in whichever way it can, the American Bazaar reported. April 15 marks the Tax Day in the US. The new federal tax law might make it more challenging for many families to figure out tax filings this year, Bera said. His office has also been educating the people about the taxpayers' rights. Everyone that disagrees with an Internal Revenue Service decision is entitled to appeal the decision before an independent board. Physician and Educator- is serving as Chief Medical Officer. He used his skills as a tough negotiator to fight to reduce the cost of health care, create jobs, and deliver care to tens of thousands of Sacramento residents. ---Ami and his wife Janine live in Elk Grove with their daughter- Sydra.